We've been hot on the heels of the upcoming OnePlus One for a while now, and yet, despite the interest the China-based company has stirred both in the East and West, the actual looks of the affordable flagship remain elusive. 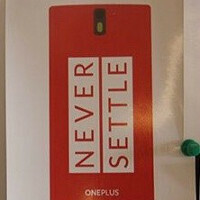 This may have just changed, however, though what we have here is shaky at best, and the picture you're looking at is reportedly based on an early prototype (the "Never Settle" motto included). Even if that is indeed the case, there's no telling whether this is the final look.